dxcc is a small command line utility which determines the ARRL DXCC entity of a ham radio callsign, based on the cty.dat country file by Jim Reisert, AD1C. It's written in Perl and self-contained. A different version of the country file can be used optionally. dxcc only requires Perl and should run on pretty much every operating system. By giving your own DXCC or callsign by the -m command line option, the distance and beam heading will be calculated too (e.g. dxcc -m DL 8Q7ZZ). An optional GUI written in Perl/Tk is available as of 20071026, and may be used by invoking dxcc with the -g command line option. 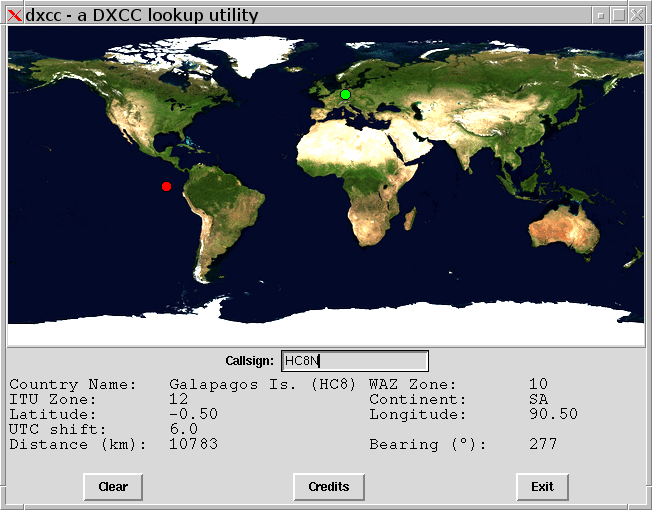 The screen shot shows the GUI which features a world map on which the location of the DXCC is highlighted. Also here, the -m option can be used (as shown in the screenshot). Of course dxcc is free software (free as in beer and free as in freedom) and published under the GPL 2. If you have any suggestions, questions, feature-requests etc., don't hesitate a minute and contact me via email: fabian@fkurz.net.